It's currently earned nearly $500 million worldwide. It's garnered more praise than any film currently released in 2013. It's attracted the attention of casual audiences despite being an original project with no famous source material. Marketed in a vague but interesting manner, Alfonso Cuaron's latest project Gravity is a sci-fi thriller grounded in the modern, realistic world - and is easily one of the greatest film of the year by far. Gravity stars Sandra Bullock as Dr. Ryan Stone, a scientific engineer experiencing her first mission in outer space, monitored by experienced space veteran Matt Kowalski (George Clooney). Though the mission runs smoothly despite Stone's evident anxieties, a catastrophic situation soon develops putting her and the entire team in mortal danger. 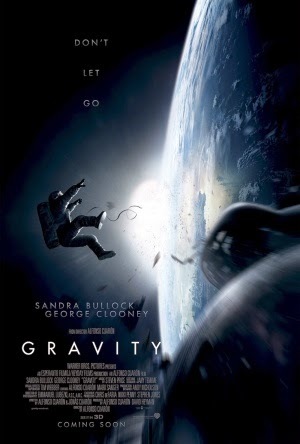 Gorgeously shot by the still excellent Emmanuel Lubezki and powerfully acted by its leading stars, Gravity constantly keeps viewers hanging on the edge of their seats - and then sinking into them as the tension unfolds. The film gets off to a quick start with its disruption to the narrative - every trailer has barely hinted at the meat of the story, which just makes it all the more interesting and approachable. All the surprises are definitely worth waiting for; the entire 90 minutes is spent in outer space but thanks to flawless pacing and enigmatic storytelling, dragged out scenes and moments of disinterest are pretty much non existent. A huge cast is never necessary for the beautiful storytelling - the isolation endured by our main characters beams into the audience as we join them in their perilous situation. Every single technique possible in film is exploited to benefit the atmosphere; the shots wonderfully depict this dark, lonely but beautiful area of space, the Earth glowing below, while the sound design, acting and editing also compliment the atmosphere. Truly, the amount of effort put into the film is apparent from the minute it begins. Gravity is highly deserving of its exceptional reputation, as it is an original, thrilling and well written sci-fi flick that manages to develop interesting characters in a very restricted situation. It's genuine from beginning to end; none of the tension is forced, none of the development is cheesy and there is not a single moment of unconvincing special effects. Aesthetically, everything is as rich as it can be - and beneath the surface is a film definitely worth viewing.